With the IMO 2020 low-sulphur fuel regulations looming, containership owners are keen to offload as many older gas-guzzling vessels as possible, with the current high scrapping rates providing added incentive. According to London-headquartered shipbroker Braemar ACM, 12 vessels with a capacity of 36,000 teu have been sold for demolition in the past 30 days, taking the year-to-date number to 30, for 52,000 teu. This compares with just 48 vessels for 88,000 teu sent to breakers’ yards last year. Braemar ACM reports on three recent demolition sales in the container sector: the 4,992 teu 2004-built Piraeus, sold ‘as is’ in Singapore at $445/Ldt; the 2,020 teu 1991-built MSC Pylos, sold for $450/Ldt; and the 1989-built 1,800 teu Oriental Mutiara, sold for $468/Ldt, for delivery to Bangladesh. The sale of the 15-year-old Piraeus is indicative of the overcapacity still prevalent in the panamax sector. 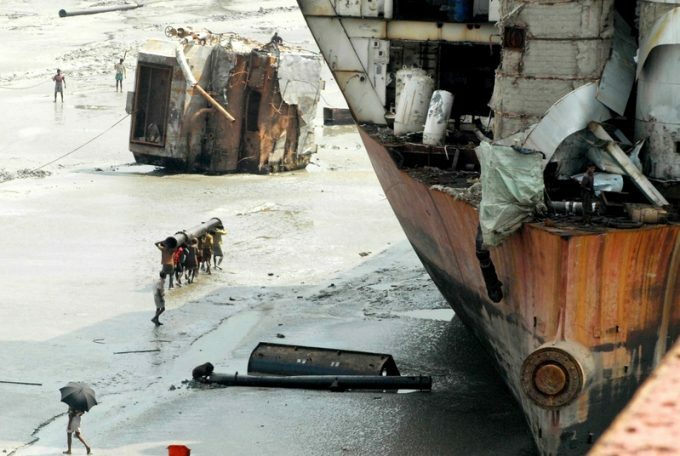 Indeed, in its last idle tonnage report, Alphaliner said there were around 40 panamax vessels looking for employment, and the situation “remains worrying for owners”. “Some owners have started addressing the oversupply issue by scrapping tonnage,” said the consultant. While containership owners are set to receive a charter market boost from the forthcoming IMO 2020 regulations, as some incumbent vessels are taken out of service for up to 40 days for the installation of scrubbers and will thus require temporary cover, it is generally in the larger sectors that carriers will be seeking replacements. Speaking during the Seaspan 2018 earnings call, the boxship owner’s chief commercial and technical officer, Peter Curtis, said it was the 6,000 teu-plus sizes where availability was becoming tight, with carriers looking to fix ships for 12 months or more to cover scrubber installation this year and next. Meanwhile, in terms of new or extensions of charters for panamax sizes, ocean carriers are tasking their brokers with finding the most economical ships on the market. One broker told The Loadstar last week he had a number of enquiries in from shipping lines for panamaxes for the third quarter of the year for two-to-three-month charters with options, but that there was little interest in longer-term charters. “What they are saying is that the ships are suitable until you get near to IMO 2020, then they are not interested unless they are either miserly on fuel consumption or have scrubbers fitted,” he said. But for the owners of older panamax vessels this is not an option, given the circa $5m cost of fitting a scrubber system and the length of time required to recover the capital expense by way of increased daily hire rates. According to vesselsvalue.com data, prior to its demolition sale the Piraeus had a market value of $9.14m and an identical scrap value.